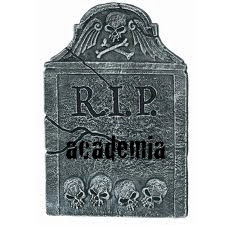 ..:recycled minds:..: Academia is Dead. Now What? Academia is Dead. Now What? own, but what are the alternatives? There is a lot of hand-wringing among scholars going on right now out here in cyberspace. Much of what I'm reading is from and by anthropologists, but from the comments on these articles, it sounds as if the issue goes beyond anthropology and extends to all disciplines, from the sciences to the humanities and everything in between. The issues being discussed are systemic - in other words, there's a problem with the system. The model of the university as a business, with increased administration that is embedded in a larger system that is cutting funds to education, is pinching those at the bottom the hardest. From what I can tell, most agree that this is the case, however the roots and causes of the problem have not been fully agreed upon. And so, challenge is upon us. The problems that I am referring to here, and to which I can relate, include issues such as the lack of a job market for young scholars, the turn towards adjunct-abuse at many institutions, the decrease in tenure track positions, stressors associated with decreased institutional funding, and the increase in administrative pressures to produce, produce, produce. In the mean time, PhD holders have reached record levels, and there are declarations that we have too many - that we have devalued the degree. Simply search for "number of PhDs" and the top results include the following titles (Google search on September 2, 2012) "Doctoral degrees: The disposable academic," "Education: The PhD factory, " "The PhD problem: are we giving out too many degrees? ", "From Graduate School to Welfare," and "The Number of PhDs on Food Stamps Triples." Things are not looking so great if you're one of the many pursuing your doctorate degree, a camp in which I squarely fall. My own story is similar to many. In the pursuit of my doctorate in Anthropology, I saw myself as lucky when I was able to teach undergraduates and assist professors in exchange for a small paycheck and the payment of my tuition. I still went into significant student debt to be able to pay my bills and get by, as teaching, assisting, and going to grad school is more than a full-time job. Things weren't great, but I went forward with my decision to pursue a PhD. I haven't had health insurance since joining academia, and I've had what I would consider minimal institutional support in the pursuit of my degree. Activities essential to career development, like conference attendance, and developing, conducting, and writing up research projects, have largely been paid for out of pocket. Now, as I am preparing to leave the field, after nearly a year and a half of dissertation research, I am unexpectedly left with no support from my department - no teaching spots, no assistantship, no tuition assistance, nothing. I don't mean to say that my own decisions have not played a role, but left in a position such as this - abruptly without support when I'm on the threshold of completing my degree - I can not help but think there is a problem with the system. And from the numerous articles, listserv discussions, and friends in similar predicaments, I know that I am not alone in my experience or my thinking. Such a common story is no story at all - it's just reality. I fear the solution does not rest in simply making changes to the system. I left a comment on a recent piece that I wrote that I think is also relevant here. It's by Buckminster Fuller: "You never change things by fighting the existing reality. To change something, build a new model that makes the old model obsolete." Right now, we, as established and aspiring scholars and intellectuals, are in the process of identifying the problem, although some of our elders have revealed that this same "problem" existed 20, 30, 40, and 50 years ago. So what to do? So what model can we develop that could reasonably usurp the current university system? Few are asking this question, but it seems clear to me that it's one that needs to be asked. For many reasons, there are significant numbers among us for whom the system is not working. Does it not then fall upon us to create something else - to create an alternative? Such a process falls directly in line with much of the discussion occurring within the Occupy movement. Our problems in the academic and intellectual world are but a part of an even larger systemic problem. For too many people, the system is not working. And so, the question remains, what does an alternative look like? And if we can imagine an alternative, how do we begin to make it manifest? Creating a change to the university system is probably impossible if other parts of the larger system don't also change. Creating alternatives may be more realistic, but what would the draw for students be if they did not get an accredited degree? Most parents and kids who are planning for college probably aren't even aware of what's going on. Would they want to send their kids to a $25,000 per year school where the professors only have bachelor's degrees? I know that's not even the issue you're talking about, but maybe if more awareness was brought to the flaws, the system would have a chance of being fixed. One thing I've been thinking about with all of this is how alternatives in education might fit into the wider movement towards "local." If an alternative institution was started in a given town or city, could it build enough recognition in that place such that local businesses and employers would value the training as much or more than a BA, MA or even PhD from some larger, national university? Could an educational institution grow out of a locality, using local resources (funds and educators) and designed to address local needs, while at the same time providing for the intellectual freedom and ability to explore and study a variety subjects - all at a level comparable or superior to what goes on in the current system of higher education? Interesting idea to think of the local university. With some of the other local movements sprouting up, why not? And if it fails, it can't be worse then the alternatives. Scary the idea of PhD to welfare. I will not be sharing that article with J-Fur. Yeah, it would obviously be a big undertaking, but I'm beginning to think we really need to think about and enact some alternatives. And I think for many people, the road to the PhD is beginning to look like the same one as the road to welfare. It is scary - and sad, that society's intellectual class is being devalued to the point of extinction (a bit of an exaggeration maybe, but not too far off either I'm afraid!). I appreciate that you don't want to share the article, Mr. B, but I already read it a while ago. And it is scary! And dooglas, I have seen many of the sources you cite, where people suggest that there are too many Ph.D.s. It makes me feel crappy, but I like anon's comment above---about how nice it would be to say "look at how many people have higher education" instead of "look at all these smart, but not too smart fools who earned a degree in thumb twiddling. as for the alternative education, I think there are movements toward this. there's a few spots here in town who offer free school classes on a wide range of topics. Hey J-fur! Thanks for your comments. Going through the PhD game myself, and I know it often feels kind of hopeless as far as how to move forward. I also wish more people valued learning and education! Between my student debt and lack of job options, I am increasingly thinking about alternatives. I'm in the middle of a couple conversations with people exploring the idea and the possibilities. Something I learned well before I went to grad school is that we create the world we live in, and I am trying to hold onto that concept. I think it's time to manifest! Views from the ANThill: Where are the Activists?